After a judge dismissed a lawsuit against her on a technicality, a prominent Missoula Republican is suing her accusers – also prominent Republican women – of slander and libel. On Wednesday, attorneys for Missoula County Republican chair Vondene Kopetski filed a lawsuit against the Montana Federation of Republican Women, two state legislators and several other GOP women for libel, slander, defamation and conspiracy after they accused Kopetski of acting in bad faith and misappropriating the funds of the Missoula County Republican Women. The defendants include Sen. Jennifer Fielder, R-Thompson Falls, Rep. Theresa Manzella, R-Hamilton, Heidi Roedel of Flathead County, Edna Kent of Ravalli County and Jane Van Fossen of Missoula County. The Montana Federation of Republican Women and the Missoula County Republican Women originally sued Kopetski in August 2017 after the Federation held a Roberts Rules of Order hearing investigating and then expelling Kopetski and her treasurer, Jill Chapman. The Federation set up a fund to solicit donations to pay for the lawsuit. Fielder, who sits on the Federation board of directors, said she chose to file the 2017 lawsuit after overseeing the internal investigation into Kopetski’s alleged actions. But the claims put forth in the original lawsuit don’t necessarily support Fielder’s contention that Kopetski was the bad actor. Kopetski founded the Missoula County Republican Women in 2013 and was its president until December 2016, when she chose to cut back on her responsibilities. Kopetski backed then-treasurer Sarah Weber for president and Jill Chapman for treasurer, and that’s when the club started to split. In April 2017, Weber asked Chapman to resign, saying Chapman wasn’t carrying out her duties, according to court documents. Kopetski told Weber at the time that she couldn’t get rid of elected officers without the approval of the board, and Weber hadn’t held any board meetings. Then four members of the six-member board, including Kopetksi, held their own meeting without Weber. They eventually voted to remove Weber from office after “a thorough investigation.” Concerned about what Weber would do, Chapman closed out the club’s account, withdrawing $1,200, which was put in a trust account. Kent and Van Fossen were the two board members who didn’t attend that meeting and who sided with Weber. Kopetski told the Missoula County sheriff and county attorney’s office about closing the account, and Sheriff T.J. McDermott recommended putting the money in a trust account, according to the Missoulian. The Missoula Current asked Kopetski what happened to the money, but got no answer. From that point on, Kopetski resumed the role of president of the Missoula County Republican Women, although Weber also claimed she was president. That’s when Weber appealed to the Montana Federation of Republican Women, which oversees all state clubs. After its investigation, the Federation ordered Kopetski to recognize Weber as president and return the money, according to the lawsuit. Weber also claimed after the fact that while Kopetski was president, she altered two donation checks, changing the recipients from “MTGOP” to the GOP “Legislative Campaign Committee.” Weber was treasurer at the time, and Kopetski said the club board approved the changes. The Missoula Current reached out to Weber, who declined to comment. Heidi Roedel, president of the Montana Federation of Republican Women, also declined comment. On July 3, 2018, about a year into the court proceedings, Kopetski filed counterclaims against the Federation and the Missoula Republican Women’s Club, bringing the same libel and slander charges she’s making now. A week later, the trial was set for January. But then Judge Olivia Rieger of Dawson County cancelled the trial and issued a decision in February that found the Federation and the Missoula Republican Women had no standing to sue. Neither the Federation nor the Missoula County Republican Women’s club were incorporated as nonprofit organizations until after the lawsuit was filed, so state law gave them no legal authority. However, the judge said the groups could try again, now that they’re incorporated. Fielder said the Federation hasn’t decided whether to pursue the case. “We decided to carry on and try to run our organization without those disruptions. So we didn’t make any decision. Now that she’s filed a suit against us, it will give us an opportunity to lay out our case before the court, and that’s actually what we tried to do before,” Fielder said. In the meantime, some Republican women say the struggle has left many Federation members conflicted, because Kopetski has been an active member of the Republican Party more than 30 years and recently was unanimously elected to her third term as chair of the Missoula County Republicans, said Flathead County Republican Chair Dee Kirk-Boon. 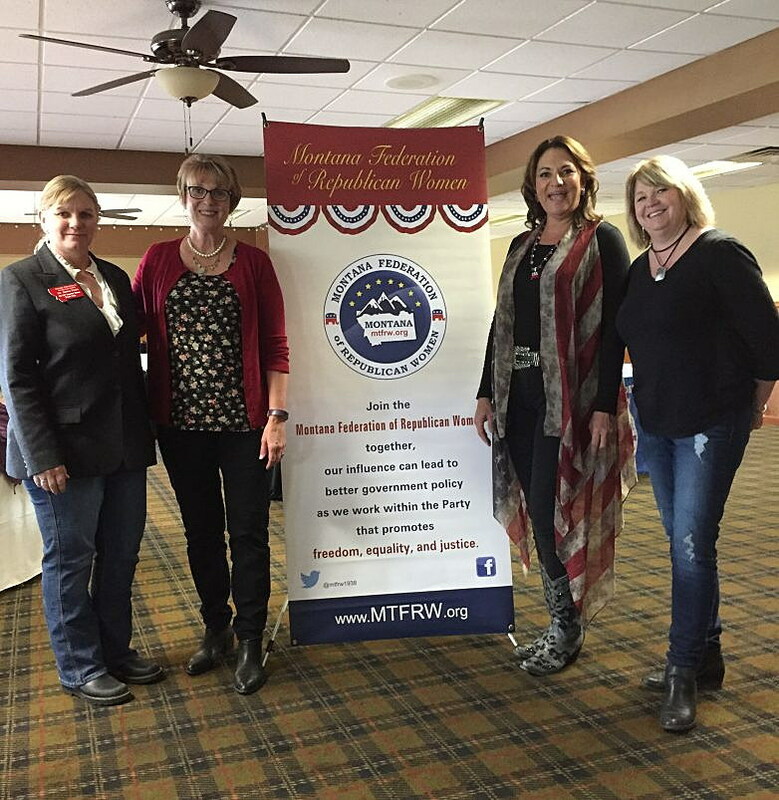 The Montana Federation of Republican Women website said it has nearly 500 members in 13 local clubs. But Kirk-Boon said the fallout has contributed to a loss of membership in the Kalispell women’s club, which fell to 30 members from 150, and the Mission Valley women’s club folded in October. Kirk-Boon herself quit the club. “I don’t want to belong to a Republican women’s club until this is settled,” Kirk-Boon said. Kirk-Boon also pointed out that Sarah Weber now lives in Polson, so she should not be allowed to be an officer of the Missoula County Republican Women, but the club website lists Weber as treasurer. That also raised the question as to how Manzella, a Fielder ally, could be the recently elected president of the Missoula County Republican Women when she lives in and represents Ravalli County. Calls to Manzella were not returned. Fielder denied that a schism has developed. “I think there’s been some efforts on the parts of some to try cause division, but I think the organization’s pretty well unified,” Fielder said.